Rappahannock River’s Many Faces: Make no mistake. Virginia’s Rappahannock River is one big body of water. At 195 miles long, it is the longest free-flowing river on the East Coast and great for exploring. Rising in the Blue Ridge Mountains a few miles southeast of Front Royal, VA, the river goes through a number of metamorphoses until it widens to a three-and-a-half-mile wide estuary prior to flowing into the Chesapeake Bay just north of Deltaville, VA. The Rapp’s northern reaches are characterized by sweeping pastoral views bookended by two sets of 100- to 150-foot tall sandstone cliffs that serve as habitat for the river’s bald eagle population. It is a fisherman’s and paddler’s paradise. In fact, portions of the river are designated a National Wildlife Refuge. The 50-foot clearance fixed bridge at Route 360 in Tappahannock limits large sailboats cruising above that point. That’s a pity because even though facilities are limited, this part of the river offers gunkholing opportunities galore. Many boaters eager to explore this stretch of the river explore the Rappahannock River Water Trail by kayak, canoe, or small boat. The river’s southern environs are much more sailboat friendly. The village of Deltaville is the logical jumping off point for a three- to four-day cruise. Deltaville calls itself the “Boating Capital of the Bay” with good reason. It boasts almost two dozen marinas and a number of repair and provisioning facilities. Locals like to say there are twice as many boats in Deltaville as there are people. Stingray Point Marina, Deltaville Marina, and Fishing Bay Marina are transient favorites. In Stingray Bay, Captain John Smith was stung by the barb of a cownose ray and fearing his immediate demise, ordered a grave prepared for his use. He quickly recovered from the incident and ordered the ray roasted for his dinner. Most marinas are served by the town’s shuttle service which conveys transients to key Deltaville provisioning and dining locales. The trolley also stops at the Deltaville Maritime Museum, a little museum that proudly showcases the town’s maritime heritage. Almost destroyed by fire in 2012, the museum houses an impressive display of model ships (skipjacks and buy boats) mostly constructed by master modeler Roland Griffin. The distinctive Deltaville deadrise workboat had a rounded stern which made retrieving nets easier for the local Bay men. There is a boatbuilding display in the back room of the museum. An electronic registry of local boatbuilders is in the works. In mid-July, the museum also offers a once-a-year boat building workshop. 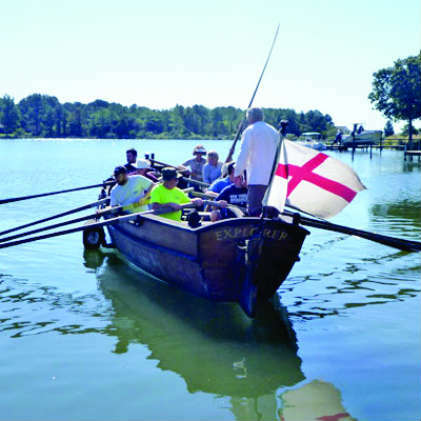 Participants are schooled in traditional boatbuilding skills and by the end of the week complete either a 12- or a 14-foot long wooden skiff, which are then pitted against one another in a friendly race down Mill Creek. Cost for the week’s class (not including lodging etc.) is around $1000. Space is limited, and slots fill up fast. Another Deltaville attraction is the Deltaville Seafood Festival. Mark your calendar for May 12. There is plenty of seafood, of course, plus crab races, a boat show, and fun for the younger set. 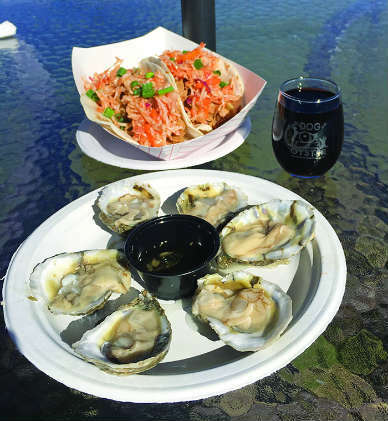 A not-to-be-missed stop on the Deltaville side of the river is the Rappahannock Oyster Company’s trendy Merroir tasting room, located in Topping just down Locklies Creek from the Rappahannock. The approach to the restaurant is straightforward. A set of floating docks makes sail-up dining an experience well worth the voyage. Transient docks are adjacent to some portion of the company’s oyster farming operation. Be sure to look at the nursery tanks. 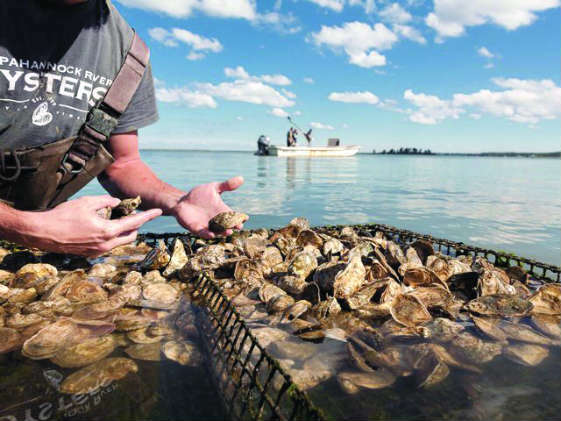 Started 20 years ago by Ryan and Travis Croxton, the Rappahannock Oyster Company pioneered the oyster farming aquaculture in Virginia. Today, the company operates restaurants in three states and in Washington, DC. It harvests and sells more than 20 million oysters per year. This reporter sampled some baked Rochambeau oysters, served with a slice of lemon and drawn butter. We also ordered a sampler plate of raw oysters: the delicate Rappahannocks with an understated saltiness; the Rochambeaus which are sweet and mildly briny with a clean, crisp finish; and the Olde Salts, with a bold sea-side brininess and a smooth, clean follow-through. If you can’t make it to Merroir, the Croxton boys will be more than happy to ship you some of their oysters by next day air. Just down the road from the Tides is the upscale bed and breakfast Hope and Glory Inn. 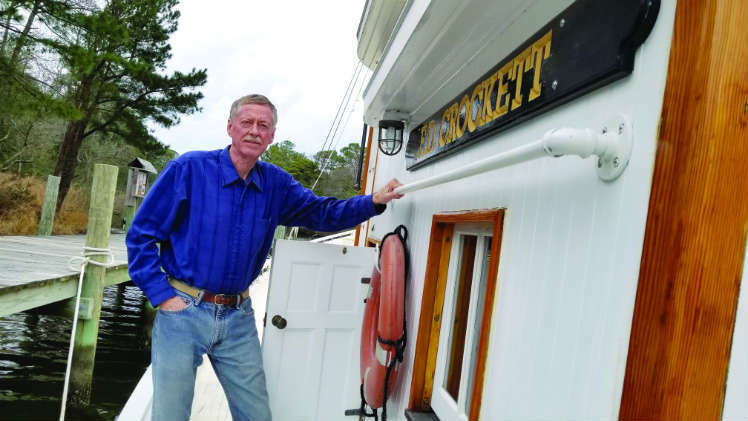 Run by Dudley Patteson and his wife Peggy, the Inn has been at the forefront of Northern Neck hospitality and cuisine since it opened more than two decades ago. Chef Bryan Byrd serves up a mean oyster taco at Patteson’s vineyard-side Dog and Oyster Restaurant. “How many places can you sip a crisp white wine in a vineyard that is only a stone’s throw from some of the best oyster grounds in the world?” says Bryan. Back on the river, head up the Corrotoman River and make your way to Yankee Point Marina. There you’ll find a 100-slip marina run by Ken Knull and his wife Karen. Yankee Point offers transients all the amenities they might want, including dockside dining and a swimming pool with plenty of room to hang out. Ken and Karen are native Mainers. And each summer they treat their customers to an old-fashioned lobster bake complete with all the fixings. Cost is only $60. Two more places in the vicinity of Yankee Point are worth a look: Belle Isle State Park encompasses 733 acres along a seven-and-a-half-mile-long shoreline in an unspoiled environment sure to please the nature lover in your crew. You can even rent kayaks and/or canoes for a fun day on the water. Be advised: approaches to Belle Isle can be tricky, and the anchorage is exposed to wind from the south and west. A short hop across Morattico Creek lies the waterman’s town of Morattico, a once-robust village that used to house the RCV Seafood Plant and now is home to retirees and a few die-hard watermen who still ply their trade in the waters around the town. 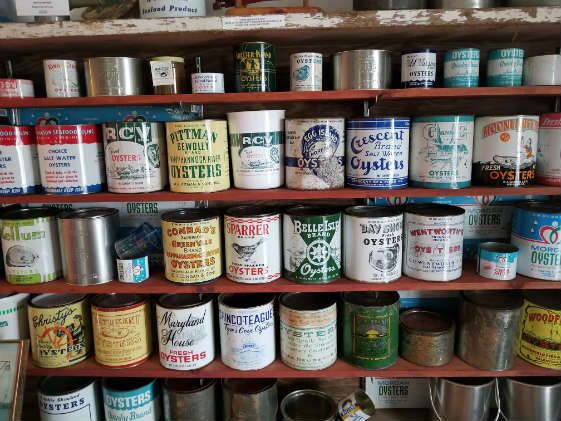 A visit to the town’s museum is worthwhile, if only to see the hundreds of items on display at the General Store that was open for over 100 years and run by nine different owners. A stroll down the store’s aisles reminds one of a simpler life, before big box stores, where 10 penny nails could be found next to the gumball machine and the proprietor and family lived upstairs. June 8-10: Typhoon National Championship Regatta hosted by the Rappahannock River Yacht Club. Over the past seven years, as many as 35 Typhoons have competed with racers coming from as far away as South Carolina and Michigan. 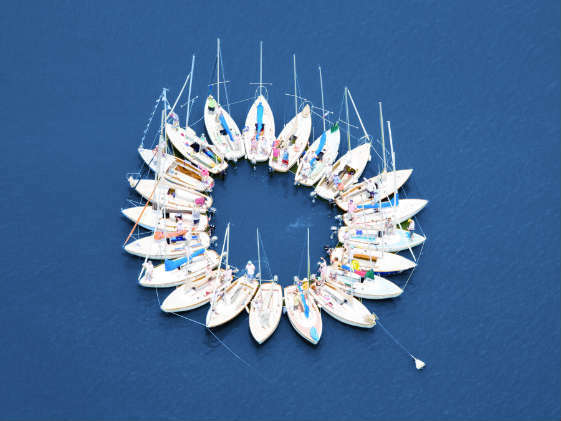 July 13-15: 20th Annual Southern Chesapeake Leukemia Cup Regatta, presented by the Fishing Bay Yacht Club, Deltaville. Sept 28-30: Hospice Turkey Shoot Regatta presented by the Rappahannock River Yacht Club. Today, stewards of the Rappahannock strive to maintain Smith’s legacy. One slurp of a freshly shucked oyster confirms the validity of the effort.